Midnyte Reader: Fit Readers - Check in: January 24, 2015. I've been forgetting to post each week, but I have been walking on the treadmill (most) every day and I went back to Weight Watchers. It helps me to either watch music videos while I'm walking or watch the tv shows that I've always wanted to. I started watching True Detectives, which I do like, but it's kind of slow. Then I tried Downton Abbey because it's free. I resisted watching so long because of the hype, but now that I am, I love it! 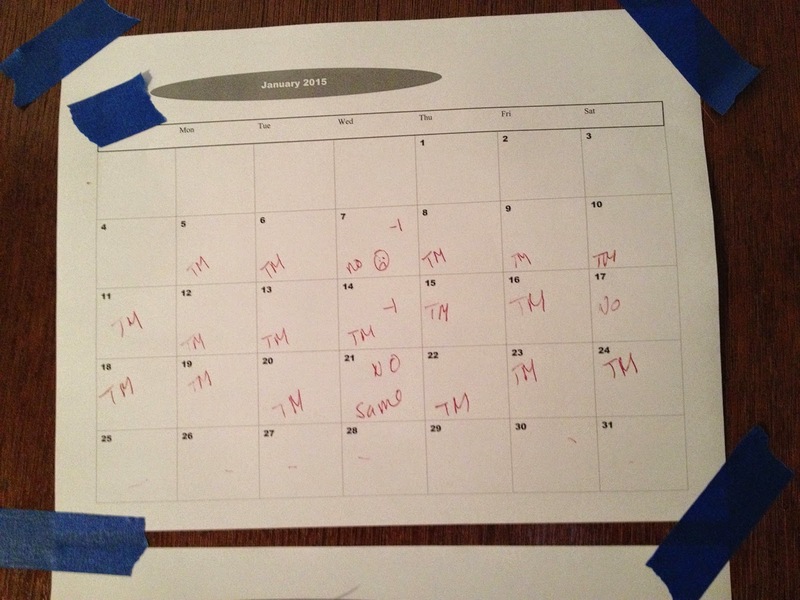 I also taped a calendar right next to the treadmill so I can mark off the days I walk and see how much I've done. I've been doing pretty well on WW, but today I had too many potato chips, so we'll see how that effects my weigh in on Wednesday. So how are you doing in your quest to get more fit? Gummy Bears are my weakness, their sweet gooieness. Great idea taping the calendar right next to the treadmill. I wish I had a treadmill, all I have is a stationary bike that mocks me. :) Great work and I hope you have a good week. Great job. I do the same thing. I have shows that I'm only allowed to watch while I'm on the treadmill. I love Downton Abbey!!! I admit I came late to that party - only started watching last year, but binge-watched seasons 1-3 before season 4 started. Now I dvr the show and watch it Monday mornings while I walk - big living room, so I can walk back and forth and get those steps in!